All right. Even for someone like me, who loves summer, this high heat and humidity has gone on a little too long. I am ready for cooler weather. In fact, this is starting to look pretty good. The picture, of course, was taken last winter when Liam looked a little frosty. And while I don’t really want it to snow—not yet—I have been thinking ahead to Christmas and to cards, which I love to send. This will be our Christmas card for 2015, and I have found it very soothing to look at it during this extreme heat and humidity. The card is a good reminder that the seasons change in Maine, that it won’t always be this hot, and that instead of melting down at around 2:00 every afternoon, soon enough I’ll be putting wood on the fire. Though Liam does look pretty adorable!! He loves the snow so much! He is one adorable dog, isn’t he? That he most definitely is!! I love that picture! He’s a perfectly happy dog! Thanks, Mary Jane. Liam loves the snow. When I first saw Liam’s photo, I thought he was a bear. Then I wondered how you got so close to a bear to take such a great picture. What a cute dog Liam is! 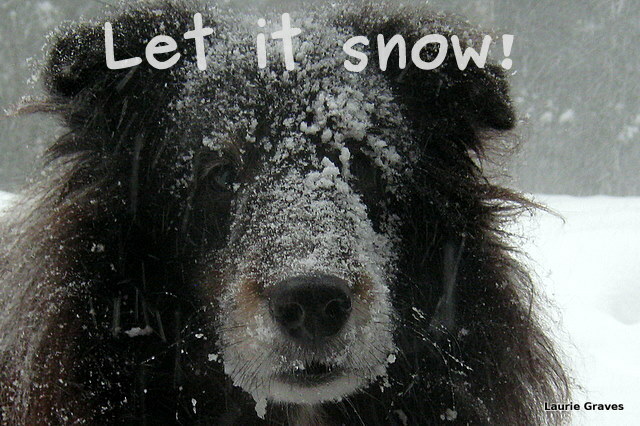 Many dogs love snow. Our Liam is the same way. Oh, adorable Christmas card – and, might I say, kudos to you for your planning ahead. Really. I don’t even know what I am cooking for dinner tonight. And yes! Enough of heat and humidity (South Jersey). My garden, my spirit, myself – we are all wilted. Thanks, Jodie! “My garden, my spirit, myself—we are all wilted” beautifully captures the way I feel. We suddenly had a shift from hot and humid to cool and, well, humid. An improvement. Jason, same here. How I long for the Augusts of yore, when the days were hot—but not too hot—and dry with cool nights.